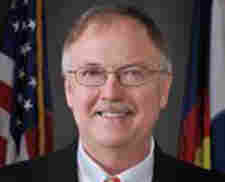 Colo. Department Of Corrections Chief Shot And Killed At His Home : The Two-Way Tom Clements was appointed by the Colorado governor in 2011, after he served for more than three decades in the Missouri Department of Corrections. Police have not apprehended a suspect. The head of Colorado's Department of Corrections was shot and killed after answering the front door of his home. Gov. John Hickenlooper made the announcement in an email sent to corrections employees. "I can hardly believe it, let alone write words to describe it," Hickenlooper wrote. "Tom Clements was shot at around 8:30 p.m. Tuesday night at his home in Monument, north of Colorado Springs, said Sheriff's Lt. Jeff Kramer. "A family member called 911 to report the shooting and officers found 58-year-old Clements dead in his home, he said. Search dogs have been called in to comb through a wooded area around Clements' home, and authorities were going house to house trying to find out what neighbors heard. "... Hickenlooper appointed Clements to the post in 2011 after he served for more than three decades in the Missouri Department of Corrections." "As your executive director, he helped change and improve DOC in two years more than most people could do in eight years," Hickenlooper wrote. "He was unfailingly kind and thoughtful, and sought the 'good' in any situation. As you all know, in corrections that is not easy." Lt. Jeff Kramer of the El Paso County Sheriff's Office told 9 News that police do not have a "suspect identified." But Kramer said "authorities do not believe the neighborhood or area where the shooting happened is in danger."